Jacobson & Schmitt, LLC is an independent financial advisory firm with one location and 6 employees. Their core services are giving sound financial planning advice and managing investment portfolios in ways that help their clients attain their goals and create a more successful future. She asked for our assistance in converting it to properly coded HTML signatures for each of the six people in the company to use. After a brief discussion of the price she extended her initial request by asking for a redesign for her team to consider. We elected to use the alternative version of the Jacobson & Schmitt logo and present a “stacked” signature design. In many cases these credentials or designations are either registered or trademarked, and hence need the ® symbol or else TM. 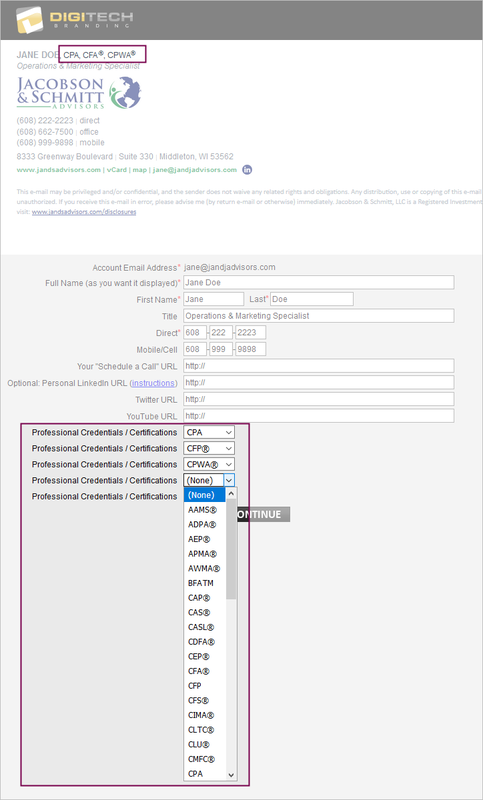 By providing Jacobson & Schmitt a drop-down menu containing the universe of likely designations or credentials, we were able to simplify their process of applying these as needed, while ensuring the proper HTML coding to create the superscript display of these, like CPWA® for example. We provided Jacobson & Schmitt with an online email signature creation portal that combined behind-the-scenes pre-populated data with user-entered data. 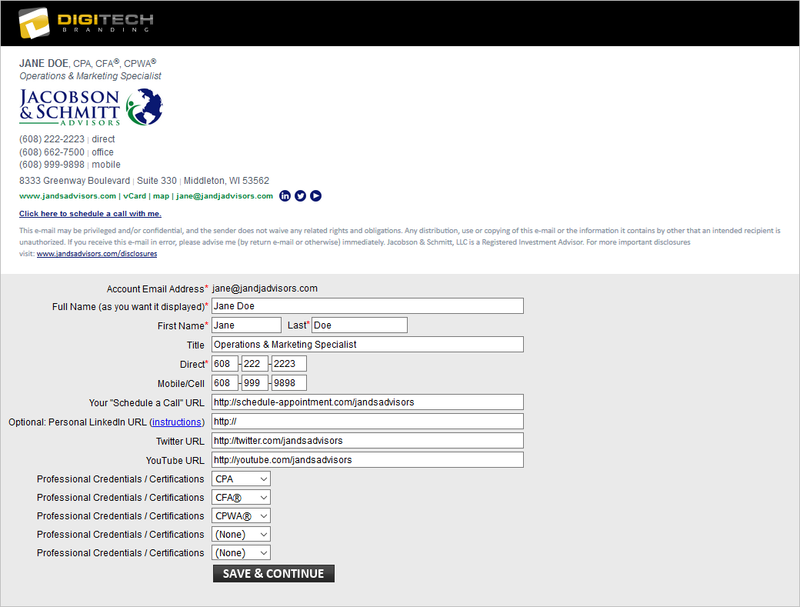 The signature creation portal URL was provided to Katie at Jacobson & Schmitt and she was able to quickly fill out the form for each of the six team members. She then had everyone install our desktop deployment app for Outlook and that was all that was required for her to complete her task. In a matter of two days (just two or three hours total) Jacobson & Schmitt had deployed a new email signature that exceeded their initial expectations, while being assured of continued prompt attention to their program by us on an as-needed basis going forward.